This is the pier at Santa Monica at sunset. It was 70 degrees and sunny in December. I don't understand how people in Southern California can live like this - never having to wear winter coats, being able to go outside and just, like, hang out without worrying about something so petty as weather. But of course it's still winter, so this photo was taken before 5pm. 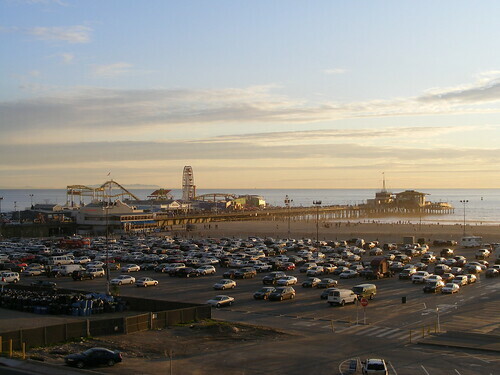 The Santa Monica Promenade was the inspiration for the Ellsworth Promenade. The name, at least. The warm weather that you write about is the reason so many granola people (nuts and flakes) live in California. When the brain is not given a chance to cool down with temps 32 degrees or colder, the brain tends to overcook. If something simmers for too long, it eventually evaporates- the brain does the same thing. Here in Maryland the brain is allowed to cool dwn and regrow-- sort of like flowering buls that need a cold spell to grow and bloom in their full glory. You better get back here soon or else you will lose your mind. Funny thing - I went to Santa Monica in December and HAD to wear my winter coat the whole trip - me and a friend got pulled aside for a local TV weather interview on how pissed us tourists were about having to bundle up while on our California vacations!